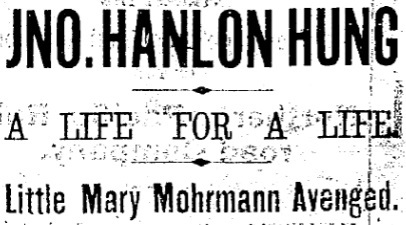 On this date in 1871, John Hanlon expiated a cold-case Philadelphia murder. Back in September of 1868, a young girl named Mary Mohrmann vanished while playing outside — her outraged corpse to be discovered days later dumped on a vacant lot a few blocks away at Sixth and Susquehanna. The crime had every hallmark of a neighborhood perpetrator, someone who would have had the ability to hide away the kidnapped or dead girl in his own home before disposing of her body nearby. John Hanlon, a nearby barber who knew Mary’s mother, numbered among the several men suspected of the crime and even detained for it. But it was frustratingly impossible to pin a solid accusation on him or anyone else. There were a few witnesses who had seen Mary led off, and a few others who saw someone abandon a bulky encumbrance where Mary was found, but among them all nobody was prepared to venture an identification. So there the matter rested, and little Mary Mohrmann’s file might to this day reside in the dusty back rooms of the Philadelphia police cold case lockers had Hanlon restraint enough to lay off the predation following his lucky escape. Now sure of their mark — indeed, seemingly tunnel-visioned in a fashion highly conducive to a wrongful conviction — police resumed their efforts to remedy that want of legal evidence. To this end, they provided the suspect a cellmate in the person of a thief named Michael Dunn, whose detail was to elicit from “Harris” particulars of his criminal career. Sure enough, this stool pigeon soon had a self-reported confession in hand. This distasteful strategem made possible the case that hanged John Hanlon: with it, the state could situate its moral certainty in a coherent narrative of the crime that Dunn read into the court transcripts as issuing straight from the mouth of the accused. While Hanlon denied to the last that he ever confessed anything to the convenient jailhouse snitch, posterity might comfort itself (as did contemporaries)* by the culprit’s conspicuous caginess when it came to his actual culpability. His refusal even to remark on his own guilt or innocence appeared to speak volumes. So it is hardly a surprise that few other Philadelphians besides Hanlon’s own mother, sisters, and 16-year-old wife** were at all troubled by the cheat necessary to noose the man. The New York Herald, whose bulletins on the case ran towards sensationalism, reported “a general sense of relief” in the City of Brotherly love post-execution. He died firmly, having immersed himself in prayer in his last days, and pronounced himself at peace with the world and with his mortal fate. Editorial from the Feb. 3, 1871 New York Tribune. * Hanlon, understandably, did not share this equanimity and at sentencing subjected the court to a bitter rant against the prosecutors who stitched him up. “I will die by murder!” he cried. “If ever another such case should come to light, lay before the jury John Hanlon’s last words, and let no more blood be spilled by perjury.” (Harrisburg Patriot, Dec. 12, 1870) Towards the end, in an interview with one of the detectives responsible, a more resigned Hanlon peacably reproached the lawman, “You and I know how it was done, and I don’t want to talk about it.” (New York Tribune, Feb. 2, 1871) By this time, Hanlon had a dying man’s thirst for reconciliation, and he apologized to the detective for the sharp tone he had taken in court. ** She was 13 when they married.